Who Invented the First Microscope? The history of the microscope spans centuries. Roman philosophers mentioned “burning glasses" in their writings but the first primitive microscope was not made until the late 1300’s. Two lenses were placed at opposite ends of a tube. This simple magnifying tube gave birth to the modern microscope. Dutch spectacle makers Zaccharias Janssen and Hans Lipperhey are noted as the first men to develop the concept of the compound microscope. By placing different types and sizes of lenses in opposite ends of tubes, they discovered that small objects were enlarged. Later in the 16th century, Anton van Leeuwenhoek began polishing and grinding lenses when he discovered that certain shaped lenses increased an image’s size. The glass lenses that he created could enlarge an object many times. The quality of his lenses allowed him, for the first in history, to see the many microscopic animals, bacteria and intricate detail of common objects. Leeuwenhoek is considered the founder of the study of microscopy and an played a vital role in the development of cell theory. 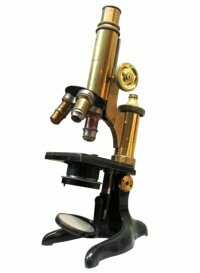 The microscope was in use for over 100 years before the next major improvement was developed. Using early microscopes was difficult. Light refracted when passing through the lenses and altered what the image looked like. When the achromatic lens was developed for use in eyeglasses by Chester Moore Hall in 1729, the quality of microscopes improved. Using these special lenses, many people would continue to improve the visual acuity of the microscope. During the 18th and 19th centuries, many changes occurred in both the housing design and the quality of microscopes. Microscopes became more stable and smaller. Lens improvements solved many of the optical problems that were common in earlier versions. The history of the microscope widens and expands from this point with people from around the world working on similar upgrades and lens technology at the same time. August Kohler is credited with inventing a way to provide uniform microscope illumination that allowed specimens to be photographed. Ernst Leitz devised a way to allow for different magnifications using one microscope by putting multiple lenses on a movable turret at the end of the lens tube. Looking for a way to allow more light-spectrum colors to be visible, Ernst Abbe designed a microscope that in a few years would provide Zeiss with the tools to develop the ultraviolet microscope. The invention of the microscope allowed scientists and scholars to study the microscopic creatures in the world around them. When learning about the history of the microscope it is important to understand that until these microscopic creatures were discovered, the causes of illness and disease were theorized but still a mystery. The microscope allowed human beings to step out of the world controlled by things unseen and into a world where the agents that caused disease were visible, named and, over time, prevented. Charles Spencer demonstrated that light affected how images were seen. It took over one hundred years to develop a microscope that worked without light. The first electron microscope was developed in the 1930’s by Max Knoll and Ernst Ruska. Electron microscopes can provide pictures of the smallest particles but they cannot be used to study living things. Its magnification and resolution is unmatched by a light microscope. However, to study live specimens you need a standard microscope. Scanning probe microscopy allows specimens to be viewed at the atomic level which began first with the scanning tunneling microscope invented in 1981 by Gerd Bennig and Heinrich Rohrer. Later Bennig and his colleagues, in 1986, went on to invent the atomic force microscope bringing about a true era of nanoresearch. The history of the microscope spans centuries, however Leeuwenhoek’s first design has remained unchanged since the 1600’s. More history is covered here on the Microscope Timeline.